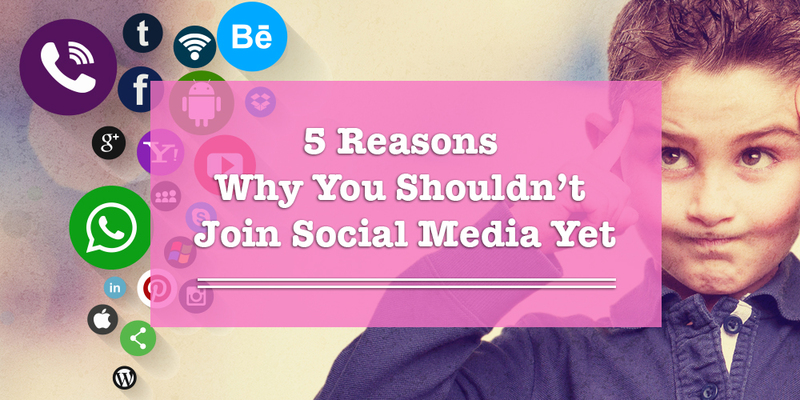 5 Reasons Why You Shouldn’t Join Social Media Networks… Yet! As a pre-teen (someone below 13 years old), do you ever feel left out because you aren’t on social media yet? It seems like all your older siblings and friends have Snapchat and Instagram accounts. You probably wish you were a bit older so that you weren’t too young to join social media networks and stay in touch with your friends. We can relate to that. Somewhere in our pre-teens, someone tells us we’re ‘too young’ to do something; it’s definitely not a good feeling. However, there are reasons why your parents and teachers say it is a good idea to wait until you’re older before you join social media networks. What did you like to do when you were 7 or 8 years old? Do you still think like those things now? Most social networks want us to post our interests online. The problem is: once you post it, you can’t take it back. Your opinions are still forming at this age. You’re exposed to many things at this age, and you will be exposed to a lot more during your teenage years. Before you join social media networks, think about whether you would like the same things 5 years from now. Before you join a social media network, you should know that some people set up fake profiles on there. They can pretend to be girls and boys your age when they’re actually much older. When these people talk to you, they could infect your computers and/or mobile phones with viruses. We see more and more cases of this happening on social media, as well. People can create fake profiles and hack into your social media profiles. Until both you and your parents are aware of how to use the Internet when you join social media networks, it’s probably wise to not create an account just yet. Do you know someone who is being bullied in school? It’s definitely not a good feeling. Bullying happens online, as well; we call this cyberbullying. People you don’t even know can post mean comments that you wouldn’t want to appear on your account. What’s worse is when people you know join them because they think it’s funny. Did you know that the average attention span of an adult is now 8 seconds long; that’s one second less than a goldfish’s attention span! Many people believe social media is part of the reason for why that is. 5. Being a Kid Offline Is Fun! Social media is good for some reasons, but it gets very addictive. Joining social media networks at an early age could lead to you relying too much on it. It’s important to feel like a kid and to spend as much time with outdoor activities and face-to-face interactions. Enjoy these moments while you can! You’re at an interesting age right now. You’re still growing, yet you may want to be able to post things on social media and share things with your friends online. You probably even know someone younger than the minimum age requirement to join a social media network and created one anyway. Sharing photos and videos with friends with fun, but it must be done when the time is right: when you have all the knowledge you need about social media networking.